In the spirit of these lists that have flooded some of the most popular media and news sites (Business Insider I'm looking at you), I thought I'd do a series for precious metals, starting with 7 ways you can keep your Gold and Silver safe (keeping in mind there is no completely risk free way to own precious metals, as is the case with any other investment). Keeping precious metals on your person may sound silly, but for the majority of the population that is exactly what they do. If you have Gold or Silver rings and other jewellery on your person, then someone breaking into your hotel, car or house is not going to be able to get their hands on them. It may be the safest place for them depending on your situation. If you have a more substantial investment in precious metals then some shabby looking sneakers (the smellier the better, less likely to be stolen) with trenches cut into the sole might fit some Gold bars (up to a kilo in each) snugly. A recent thread on Silver Stackers highlighted the care you need to take if deciding to store your precious metals at home, where during a break-in thieves had emptied potted plants, pulled out electrical sockets, removed picture frames, moved furniture and more. You really can't be too careful here, but if you decide your home is a more secure place than any, then you might consider taking a look at this book for some ideas: How to Hide Anything - Michael Connor, keeping in mind that if you can read a book about where to hide something, then so can a thief. Be creative and don't share your ideas publicly. This is a personal favourite of mine. 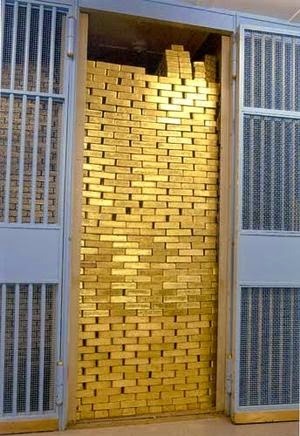 If there is anywhere that's likely to be safe for your Gold and Silver it's in a facility that is built for that very purpose. Just remember that not all safe deposit box facilities are created equally. Many large banks will offer safe deposit box services, make sure you shop around for the mix of safety and price that best fits your situation as in my experience both of these factors can vary substantially between providers. While I expect it's far less likely today than in times past, you should consider that keeping precious metals in a safe deposit box does make it an easy target for any government crackdown and confiscation should it occur. Now this wouldn't be my first choice, putting my safety (or that of my loved ones) at risk, but if you are up to the challenge of defending your Gold and Silver at home, then you may not even need to hide them. You could take some martial arts classes or buy yourself some weapons (depending on what is legal where you live, knives or guns). Just be sure that you are familiar enough with local laws to know what constitutes 'self defense' should someone break in while you are there to take action. Another option to defend your precious metals at home might be to buy a guard dog, just be sure you are ready for that commitment. If you do keep your stack at home perhaps one of the easiest ways to protect your stack is just to limit the number of people you tell. As they say 'Loose lips sink ships'. That also means being wary of giving out your address when buying or selling precious metals via post. Either get a post office box or get them shipped to work. Having your precious metals shipped to a home address is asking for trouble, even if you don't store them there permanently. I would suggest the safest way to store your precious metals (if done right) is to seal them up into airtight containers and bury them somewhere on your own property (assuming you have one that is large enough to do so discreetly). That said this method should also be used in conjunction with the tip above about keeping quiet about your stack as burying your metals is far from infallible if someone knows to search your property with a metal detector. One woman lost over a quarter million dollars worth of Gold Krugerrands using this method after burying a safe full of them. If you do use this method, make sure you have a surefire way of finding them again and that at least a trusted loved one knows where they are in case something happens to you. One way to avoid the loss of something is to never own it in the first place. If you don't have any precious metals then you have none to lose. However the way I see it, those who don't hold any precious metals also have a lot to lose. This is one of those cases where you can be damned if you do, damned if you don't. Just remember, not all of these methods are practical for everyone. You should take into consideration your location and personal situation before making a decision on how to best keep your precious metals protected. Safe stacking! I'm sharing links and opinions daily on Twitter (@BullionBaron). How Safe Are Unallocated Bullion Accounts?